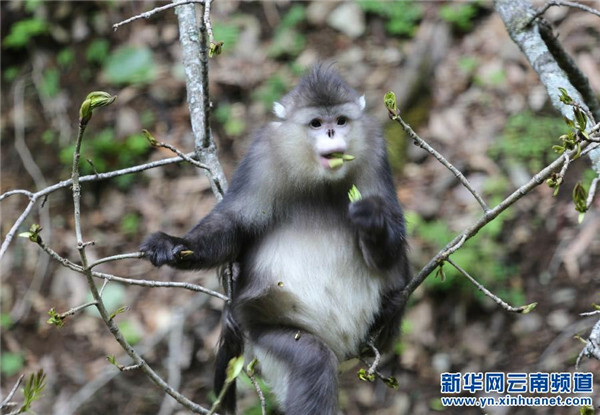 The Hongla Mountain National Nature Reserve, in Markam county of the Tibet autonomous region, has seen a steady increase in recent years in the number of Yunnan snub-nosed monkeys, a severely endangered species, according to a local official. The population of the monkeys, which are under China's level-one protection, has grown from fewer than 400 in the 1980s to nearly 800, thanks to a special national fund and the enhanced awareness of local residents, said Rentsing Pyingtsuo, head of Markam's Bureau of Forestry. The Hongla Mountain area is a major habitat of the Yunnan snub-nosed monkey. In 2003, the area was established as a national-level nature reserve to protect the rare species. The reserve is located 71 kilometers from Markam. It's an area of 185,300 hectares, of which over 70 percent is covered by forest and most of which is uninhabited by humans. The mountains rise from 2,200 meters to 4,700 meters above sea level. Research has found that the reserve is home to 447 kinds of vascular plants and 158 types of vertebrates, including other animals under national level-one protection, such as the clouded leopard, snow leopard and wild ox. Since 2003, the State Administration of Forestry has invested more than 10 million yuan ($1.61 million) to improve infrastructure in the reserve, including construction of management and protection stations, monitoring points, a wildlife rescue center and the purchase of vehicles and equipment. In recent years, the local forest bureau has hired 10 full-time patrollers to better protect the snub-nosed monkeys and collect relevant data. The population of Yunnan snub-nosed monkeys has grown from fewer than 400 in the 1980s to nearly 800 in Tibet.